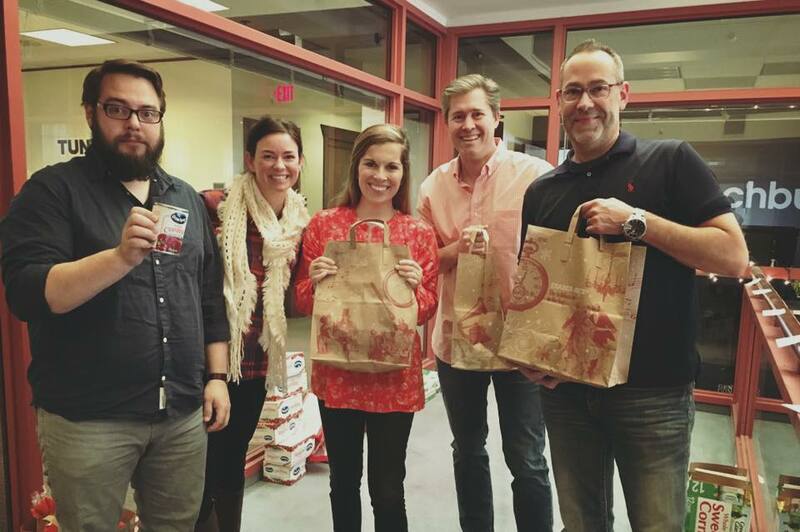 At Hatchbuck, one of our core values is “Make a Difference,” and Thanksgiving is the perfect time to do just that. This year, our team raised money, did some shopping and assembled 35 Thanksgiving day meals for families in need – complete with the stuffing, sweet potatoes and pumpkin pie. It feels great to unite as a team and make an impact in our community – but giving back is more than just a feel-good endeavor. Giving back is smart, because consumers pay attention to the good deeds of businesses, whether that’s sponsoring a charity race, organizing a food drive or making an effort to try and improve the community in which the business operates. By making your company’s presence felt you are also promoting your brand in an organic way—as the byproduct of giving back, not as the main reason for it—you wind up doing some very effective marketing. In fact this kind of “cause-based” and “community-based” marketing can be done in a very small way and still resonate widely. According to May 2013 study from Cone Communications and Echo Research, 82 percent of American consumers consider a company’s social responsibility when deciding whether to buy from them. And a recent Gallup meta-analysis found that companies that encourage employees to participate in activities that benefit the community have higher productivity and profitability than those with little or no employee engagement. Customers also noticed—those same small businesses had 12 percent higher customer loyalty. Being a good corporate citizen (regularly, if possible, not just around Thanksgiving) should really be a part of your business’ DNA. The idea of “benefiting through giving” isn’t new—there are lots of examples of companies that have done well by doing good. It builds trust in your brand and helps you and your employees make valuable and lasting connections within that community. 1. Clean out your closets. It doesn’t need to be Spring for you and your employees to clean out closets and donate the clothes, blankets, books and toys that aren’t of use anymore (but are in good condition) to those who can use them. Ask employees to bring those donations to a central point in the office. Find a local church or shelter where they are needed and donate them. Work with a local charitable organization to identify a local family that is having a hard time financially this holiday season and create a list of what they need to have a good Thanksgiving—whether that’s a turkey, other ingredients, cooking utensils, a gift card to a supermarket, clothing, etc. 3. Donate your expertise and time. Rather than having one of your most adept software engineers serving soup at a homeless shelter or buying groceries for a needy family, find opportunities for them to donate their expertise. Those software engineers could teach STEM courses at an inner city school once a week or as a two-day intensive program to ignite a love of science and technology. Check with local shelters and community organizations in your area. Many offer mentor programs to help their patrons prepare for interviews or work on resumes for job opportunities. 4. Volunteer together at a food pantry or soup kitchen. Allowing your team to take off one morning or afternoon a quarter to serve breakfast or walk adoptable shelter dogs together will not only help your community but will also bring your team closer. 5. Give a charity stipend to each employee. Every business, small or large, should support charitable organizations in their local vicinity (or the local chapter of a national one). You can do that as a business or you can give each employee a certain amount of money, even just a couple of hundred dollars, to give to the nonprofits of their choice. It does a few good things at once—it puts the focus on your employees rather than the business, and it empowers employees to give back to charitable organizations whose missions they support. 6. Sponsor a holiday-related event. Thanksgiving spurs a plenty of charitable events—from 5K Turkey Trots to food drives for those who might otherwise not have a Thanksgiving Dinner. Your business can be a sponsor of the event or you can offer to donate something within your business’ area of expertise, for example, printing signs, doing some marketing, or donating product (like after-race snack bars or fruit). 7. Donate a portion of sales to a non-profit charitable organization. Try to choose a charity that’s somehow connected to your own business. If you have a restaurant, for instance, you could support a food pantry. If you run a coaching business, you might donate to an organization like Dress for Success, which gives women in need professional attire, support and development tools to help them succeed in the work world. If you aren’t sure, post a poll on your company’s Facebook page and ask customers to help you select a charity. You could donate a portion of sales between Thanksgiving and the winter holidays, or a portion of your sales at year-end. Once the choice is set, make sure to post it on your website and other social media so customers know that by patronizing your business they are also supporting a charity. Organize your employees to bring flowers (or home baked cookies or other special surprises) to a senior center or skilled nursing facility and spend a couple of hours chatting with residents, playing cards, chess, checkers or doing crafts. Encourage employees to bake up batches of whatever they like—cookies, brownies, cupcakes—and pick one or two places to bring them as a way to say “thanks for your service,” like the local police station, firehouse or animal shelter. 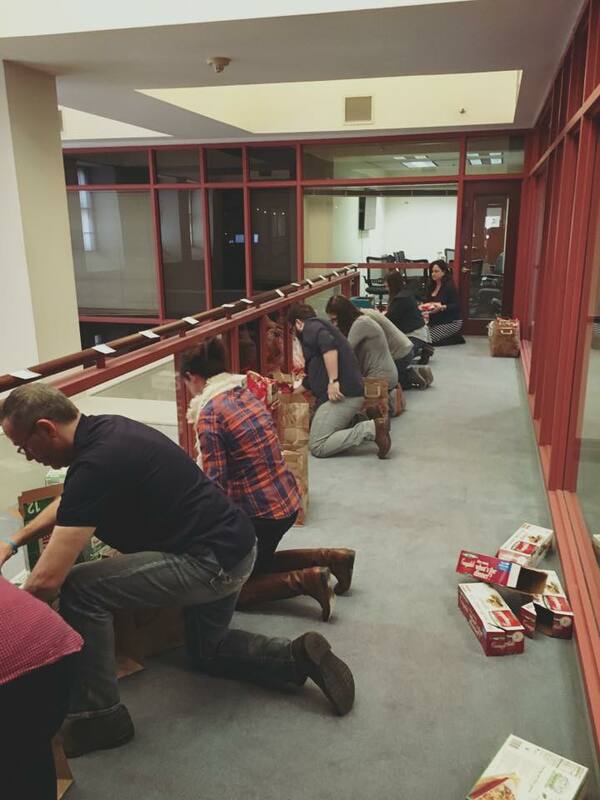 Get your team together and put together Thanksgiving baskets for the needy. Ask employees to donate what they would like to these baskets—things like potatoes, a box of stuffing, gravy, canned soup, cornbread mix, or cans of yams, corn, green beans, fried onions, or a pie. The company could donate gift cards to grocery stores and provides the baskets. Get together one afternoon to assemble the baskets and then hand deliver them or work with a charitable group to donate baskets to those in need during the holiday. 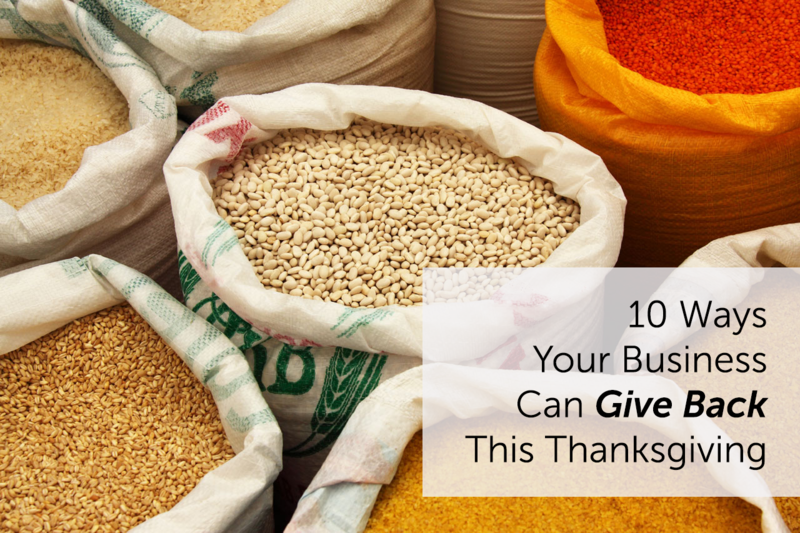 Volunteering for Thanksgiving (and year round) will have a plethora of benefits for your small business including team building, positive PR and a mental break from the hustle and bustle of business day-to-day.